The Horizon Tower is a 44-floor residential tower in the Dubai Marina in Dubai, United Arab Emirates. The tower has a total structural height of 190 m (623 ft). 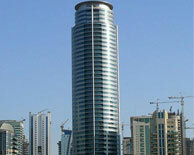 Construction of Horizon Tower was completed in 2006.